The dramatic location of this ancient fortress contributed to its dramatic history. Northwest Russia contains a number of imposing medieval fortresses, such as Pskov and Novgorod. But none is so dramatically located as the ancient stone citadel at Izborsk, a small town about 20 miles west of Pskov. At this site a large formation of Devonian limestone thrusts through the earth’s surface and forms a ridge on which the town and its fortress rest. The stone ramparts of the craggy citadel provide a stunning overview of the valley containing the small Gorodishchenskoe Lake, which connects with Lake Pskov and, ultimately, the Baltic. The first recorded reference to Izborsk is in 862 when Riurik, the semi-legendary Varangian founder of Russia’s first dynasty, arrived in Novgorod and assumed power over a large territory of the Eastern Slavs. Medieval chronicles state that Riurik was accompanied by two of his younger brothers, who were assigned areas of their own: Sineus in Belozersk (on White Lake) and Truvor in Izborsk. During the 11th and 12th centuries, the early fortress was gradually augmented with stone walls. 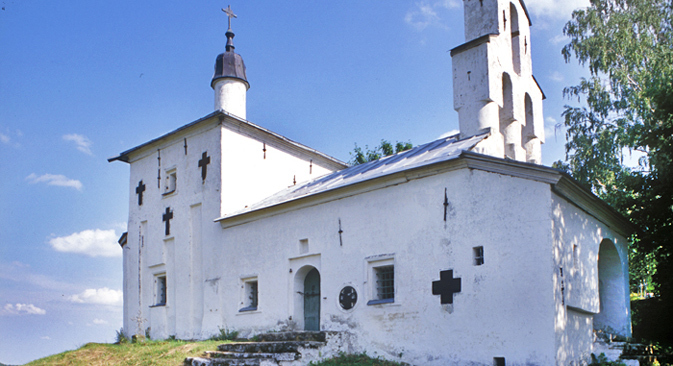 By the early 13th century, Izborsk was increasingly attacked by Teutonic knights in the Livonian Order. In 1232-33 the knights overwhelmed the defenders, but Pskov retook Izborsk soon thereafter. In 1240, the Livonian Order launched a larger campaign that threatened the power of Novgorod itself at a time when the Mongol invasion had devastated the Russian heartland. In the summer of 1240 the knights successfully stormed Izborsk despite widespread resistance that evidently cost the lives of hundreds from the Pskov area. To get to Izborsk take a regular train from Moscow to Pskov (Leningradsky railway station). The trip takes 14-16 hours. Than you need to take the Pskov-Izborsk bus. The trip takes 35 minutes. Following their success at Izborsk the armored knights took Pskov itself, where they remained until March 1242 when they were driven out by Russian forces led by Novgorod’s Prince Alexander Nevsky. This crusade by the Livonian Order conclusively ended a month later with their rout by Alexander Nevsky in the famous Battle on the Ice at Lake Chud on April 4, 1242. Although Alexander Nevsky’s decisive victory (popularly immortalized by Sergei Eisenstein’s 1938 film) put an end to major crusades against the Eastern Slavs, Pskov continued to confront the Livonian Order. Consequently, the exposed Izborsk fortress remained vulnerable to border conflicts. In addition a gradual increase in population strained the limits of the Truvorovo gorodishche. By the beginning of the 14th century a stone tower (“Lukovka”) had been erected on nearby Zheravya Hill, a prelude to the creation of a new Izborsk fortress in 1330. The initiative came from one Seloga, a leader of the Pskov republic, which flourished from the mid 14th to the mid-15th centuries. In 1349 the Livonian Order besieged the new citadel and was compelled to withdraw with heavy losses.In 1368 another attack with siege equipment was also repulsed. The original stone walls of the fortress on Zheravya Hill were relatively low; but decades of rebuilding and expansion that extended into the 16th century eventually gave the citadel its present imposing form. Constructed of fitted limestone slabs, the high walls and seven stout towers enclose an irregular triangle. The fortress had two gates: the main, west gate, which led to the commercial district, and a smaller east gate over the slope that led down to the lake. In 1510, during the reign of Basil III, Izborsk was absorbed along with Pskov into the Muscovite state. Its dangerous position as an exposed border outpost was alleviated with the construction of massive stone walls at the Pskov Dormition Cave Monastery ( Pechory), founded in 1473 some 10 miles northwest of Izborsk. Yet even with the protection of Moscow , threats to the Izborsk fortress continued, particularly during the Livonian War in which Ivan the Terrible attempted to expand Muscovy’s frontiers to the west. In 1581 Stephen Bathory (1533-86), the ruler of Poland and a skilled military commander, laid siege to Pskov. Although Pskov valiantly withstood the 6-month siege, sparse records indicates that Izborsk was captured and then returned by peace treaty the following year. During the Time of Troubles in the early 17th century, Izborsk was again attacked but never taken. Following the reign of Peter the Great (1672-1725) and the expansion of Russia to the west, the military significance of Izborsk waned. Fortunately, the isolated fortress was not dismantled, but remained a monument to the dramatic past of the Pskov lands. Its historic significance was acknowledged in the 1840s, when essential repairs were made to maintain the walls. Within the Izborsk fortress the dominant element is the Cathedral of St. Nicholas, whose basic structure, in the austere Pskov style, dates to the early 14th century. By the 16th century the church was expanded with the addition on its south side of a chapel dedicated to the Transfiguration of the Savior. The current bell tower dates from 1849. The territory of the Truvor citadel has its own sacred monument, also dedicated to St. Nicholas and originally part of a monastery founded in the 16th century under the guidance of the Pskov Cave Monastery. The Church of St. Nicholas on the Citadel (“na Gorodishche”) was rebuilt of stone and brick in the 17th century. The facades of this austere form are decorated with embedded stone crosses. Rising above its west end is a graceful two-tiered bell gable. Near the Church of St. Nicholas is a large primitive stone cross named after Truvor and popularly associated with that legendary 9th-century figure. On the basis of its inscription the cross has in fact been dated to the 14th or 15th centuries, when it was placed as a memorial to the former citadel. The area adjacent to the two fortresses is graced with small parish churches and chapels. The Church of the Nativity of the Virgin originated in the 16th century as part of a convent and was rebuilt in stone during the 17th century. Nearby is the Church of Saints Sergius of Radonezh and Nikander of Pskov, originally built of wood in the early 16th century and rebuilt in its present archaic style in the latter part of the 18th century. These diminutive churches are especially appealing in the summer, when they are surrounded by flowers. Izborsk is now a popular destination, with well-preserved monuments and an excellent museum set in a stunning landscape. Readily accessible from Pskov, ancient Izborsk has become a model for the development of cultural tourism in Russia.